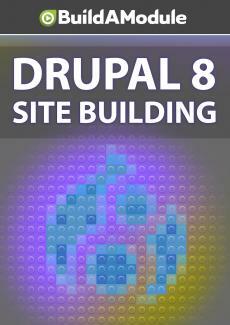 Quiz for chapter 8 of "Drupal 8 Site Building"
You have questions? No, WE have questions! Time to check in with Quizetron9000. - [Robot] Quizetron9000. Just like with previous quizzes, you can record your answers and then check them in the solutions video for this chapter. Question one, anonymous users can post comments by default, true or false? Question two, what do you need to do to enable commenting for a comment type? Check all that apply. A, Turn on comments in the content type edit form. B, Install the Disqus module. When you have an active membership, you will be able to see your progress here. If you're looking to get started with Drupal 8, this is a great place to begin. In this series we build a practical Drupal 8 site from start to finish and get immersed in the most essential techniques, terminology and tools needed for both professional and hobbyist site builders. No matter how you work with Drupal 8 - as a site builder, programmer, front end developer or project manager - what you learn here will provide a solid foundation. This video collection is intended for those who are completely new to Drupal, or for those that want to make sure that they have a solid foundation before moving on to more advanced projects. We assume you know nothing about Drupal, and lead you from start to finish through a practical project. There are no specific prerequisites for this collection. 3:53Welcome to "Drupal 8 Site Building"
1:17Quiz for chapter 2 of "Drupal 8 Site Building"
0:45Challenges for chapter 2 of "Drupal 8 Site Building"
7:10Solutions for chapter 2 of "Drupal 8 Site Building"
1:35Quiz for chapter 3 of "Drupal 8 Site Building"
0:41Challenges for chapter 3 of "Drupal 8 Site Building"
5:25Solutions for chapter 3 of "Drupal 8 Site Building"
1:17Quiz for chapter 5 of "Drupal 8 Site Building"
0:19Challenges for chapter 5 of "Drupal 8 Site Building"
4:37Solutions for chapter 5 of "Drupal 8 Site Building"
1:17Quiz for chapter 6 of "Drupal 8 Site Building"
0:31Challenges for chapter 6 of "Drupal 8 Site Building"
5:09Solutions for chapter 6 of "Drupal 8 Site Building"
1:51Quiz for chapter 7 of "Drupal 8 Site Building"
0:23Challenges for chapter 7 of "Drupal 8 Site Building"
8:43Solutions for chapter 7 of "Drupal 8 Site Building"
1:11Quiz for chapter 8 of "Drupal 8 Site Building"
0:33Challenges for chapter 8 of "Drupal 8 Site Building"
7:50Solutions for chapter 8 of "Drupal 8 Site Building"
1:07Quiz for chapter 9 of "Drupal 8 Site Building"
0:27Challenges for chapter 9 of "Drupal 8 Site Building"
7:17Solutions for chapter 9 of "Drupal 8 Site Building"
0:59Quiz for chapter 10 of "Drupal 8 Site Building"
0:25Challenges for chapter 10 of "Drupal 8 Site Building"
5:22Solutions for chapter 10 of "Drupal 8 Site Building"
0:47Quiz for chapter 11 of "Drupal 8 Site Building"
0:29Challenges for chapter 11 of "Drupal 8 Site Building"
5:56Solutions for chapter 11 of "Drupal 8 Site Building"
2:09How contact forms work, what the configuration options means and how to use "weight"
1:11Quiz for chapter 12 of "Drupal 8 Site Building"
0:23Challenges for chapter 12 of "Drupal 8 Site Building"
5:44Solutions for chapter 12 of "Drupal 8 Site Building"
1:29Quiz for chapter 13 of "Drupal 8 Site Building"
0:27Challenges for chapter 13 of "Drupal 8 Site Building"
4:31Solutions for chapter 13 of "Drupal 8 Site Building"
1:23Quiz for chapter 14 of "Drupal 8 Site Building"
0:27Challenges for chapter 14 of "Drupal 8 Site Building"
4:04Solutions for chapter 14 of "Drupal 8 Site Building"
1:05Quiz for chapter 15 of "Drupal 8 Site Building"
0:17Challenges for chapter 15 of "Drupal 8 Site Building"
4:00Solutions for chapter 15 of "Drupal 8 Site Building"
9:12Credits for "Drupal 8 Site Building"
Below are the supported keyboard shortcuts for our video player. Answer a few quick questions and we'll help you figure out what to watch first. See a full list of all 2000+ videos on BuildAModule (great for quick browser searching). Learn more about the different video collections. Conduct free, easy-to-plan trainings using the BuildAModule material. Go solo with a single user, or give multiple team members access through one account and get discounts by bundling multiple users into a single membership.